Pixelmator 3.7.4 – Powerful layer-based image editor. Pixelmator is a layer-based image editor. You can quickly create layers from your photos, other pictures, from selections, or even your iSight. Yes, Pixelmator can add a layer to your composition directly from your Mac’s little camera. 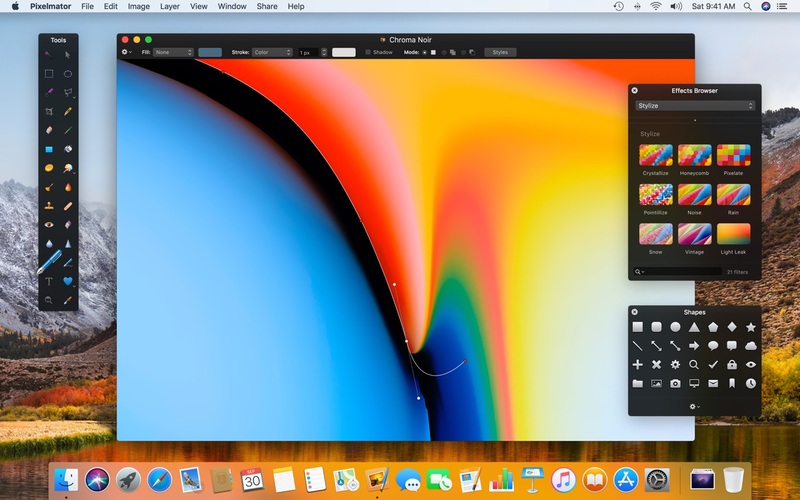 Not only can you link and arrange added layers, but Pixelmator also allows you to blend layers, change their opacity, create clipping masks, or even add layer masks to hide some portions of a layer. It was not possible to use the Copy Layer Style and Paste Layer Style commands. Fixed. When printing, smaller images will no longer use the Scale to Fit Option by default. The last used Print dialog settings will now be remembered for individual documents. File > Page Setup has been unified with File > Print. While transforming layers, parts of the transformed layer would be temporarily left behind after resetting the changes. Fixed. Fixed an issue with the Soften and Sharpen tools in the Pixelmator Retouch extension for the Photos app. Next story QR Factory 2.9.14 – Professional QR code creator. Previous story Navicat Premium 12.1.9 – Combines all Navicat versions in an ultimate version.